German chassis manufacturer Mach1 had every reason to rejoice last weekend. At the final of the ADAC Kart Masters in Bavarian Wackersdorf, Julian Müller achieved the overall victory in the hard-fought shifter kart class KZ2. Tim Tröger also impressed completely and achieved the vice-championship in the OK class for his team. Last weekend, everything was at stake for 163 drivers at the Prokart Raceland in Wackersdorf once more. In the final ranked races of the ADAC Kart Masters, all drivers fought for the last remaining points in the strongly manned championships of the renowned racing series. Under partially difficult conditions on the 1.190m long track, Mach1 Motorsport sent four drivers into the races and showed a brilliant performance. Erik Müller experienced a retained Saturday at the X30 seniors and was on the 25th place of the interim rankings after a severe racing accident during the last heat. Due to his injuries, he was then only able to enter the second final race but still achieved a conciliatory ending: he raced forward from the end of the field to 16th position and thereby achieved a good final result of his rookie season. Tim Tröger belonged to the big title favorites at the OK. With the second place at qualifying and second place after the heats, he lived up to this role at the beginning of the weekend. During the first ranked race, the Plauen resident showed his best form by coming in second and driving the best time of the race. In the second race, the tire selection, unfortunately, put a spoke in his wheel though. On the drying track, the Saxon chose rain tires and unfortunately had to forfeit the race prematurely. This didn’t change the outcome of the championship anymore though and Tim was honored as the vice-champion of the OK class in the evening. David Liwinski started into the first race from 18th place after unfortunate heats and then showed some action. In the strongly manned OK-field, he drove forward to 10th place during the first race and even achieved jumping on the winner’s podium at the second race by coming in third. Julian Müller traveled to the final in Wackersdorf with high ambitions. In the shifter-kart class, the decisions were still to be made at the last event, which is why the Cologne resident started his catching-up race immediately after coming in eighth at qualifying. By ending up on 5th place in the interim rankings, Julian highlighted his upwards-trend for the first time and even improved this by coming in third at the first ranked race. During the second race, Julian proved his skills by coming in eighth as well. In the end, a freeze during the second race left no doubt and the KZ2-routine driver achieved the well-deserved ADAC Kart Masters title. Next weekend, the team is going to travel on again. The Kart World Championship is then going to take place in Genk and Mach1-Kart wants to impress on international ground. 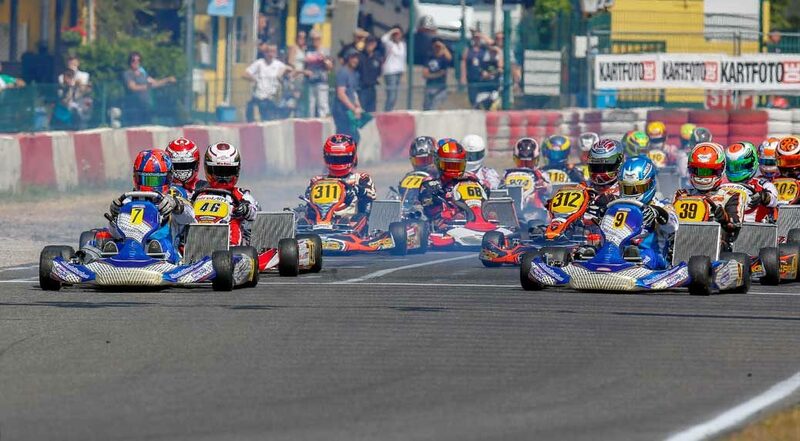 This past weekend the final of the German kart championship was held in the Belgian Genk. Mach1 Motorsport started with five drivers and belongs once again to one of the top teams. Sunday night, the only German kart manufacturer was happy about Pawel Myszkier coming in fourth place in the DMSB shifter kart cup. After lastly big success in the IAME X30 Euro Series and the Polish X30 championship, Mach 1 was back at the German kart championship.184 participants from over 20 nations started in the final in the Belgian Genk. Two weeks before the kart world championship in the same place, the categories were staffed top-class. The Italian top-pilot Macro Zanchetta was a new addition to the team. He used the races in the German shifter kart championship to prepare for the world championship and made his debut in the first heat coming in second place. The following races did not run as smoothly so that he started the second final from the end of the field. Within the 19 laps, he fought his way up through the top-class field and saw the checkered flag as the 13th driver. “Marco integrated very well into our team and it is fun to work with him. His experience is major and it helps us as well to develop further”, team boss Martin Hetschel praised his new member. 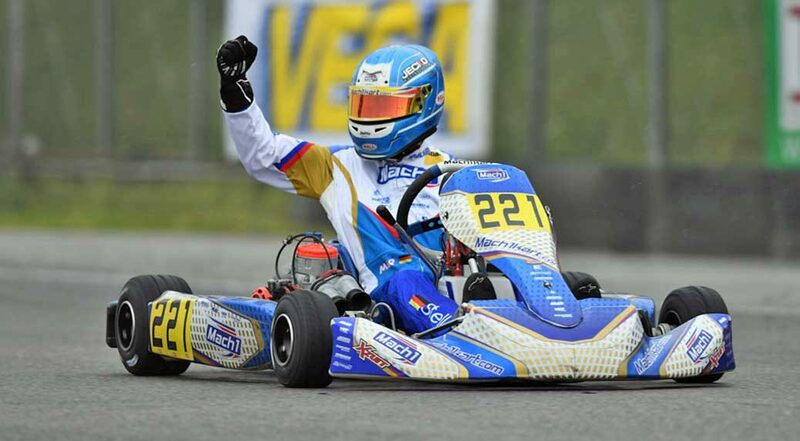 Pawel Myszkier belongs to the top drivers in the SMSB shifter kart cup and fulfilled his role also in Genk. Disregarding his deficit in the second heat, he was always placed under the top five and finished both finals in fourth place. He was rated the same place in the overall rankings. His team colleague Tim Schröder showed his great development and became even faster throughout both days. In the end, he landed 16th in the point rankings. Also, the German kart championship had an outstanding occupancy in the finals. Liwinski and Tim Tröger accepted the challenge and experienced tough qualifyings. Coming in 25th and 26th, the duo did not meet their expectations. In the course of the heats, fought his way to the front and qualified as the tenth driver for the finals. Ranked seventh place he came up with better but had to record a failure in the second heat. His team colleague Tim Tröger had a difficult time on Saturday finding the perfect rhythm but drove from rank 18 onto eight rank. The team will continue in a few days with the final of the ADAC Kart Masters in Prokart Raceland Wackersdorf. 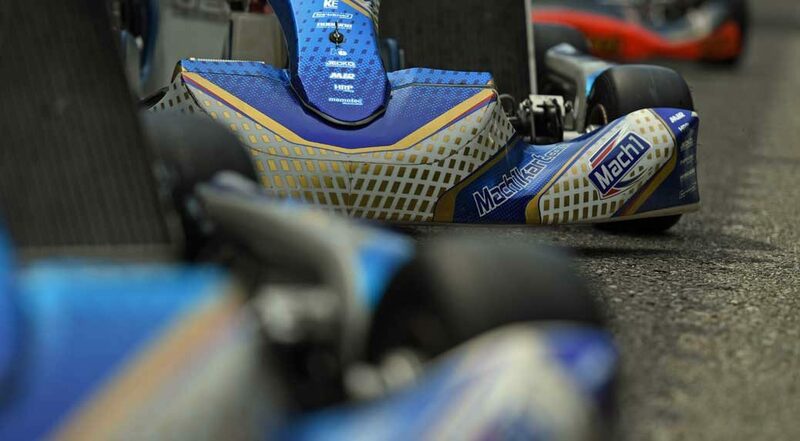 The Italian Marco Zanchetta reinforced the Factory Team of the German kart manufacturer Mach1-Kart. He has his premiere at the German shifterkart-championship in Genk. The big highlight is waiting two weeks later at the international KZ2 Super Cup within the scope of the FIA Kart world championship. 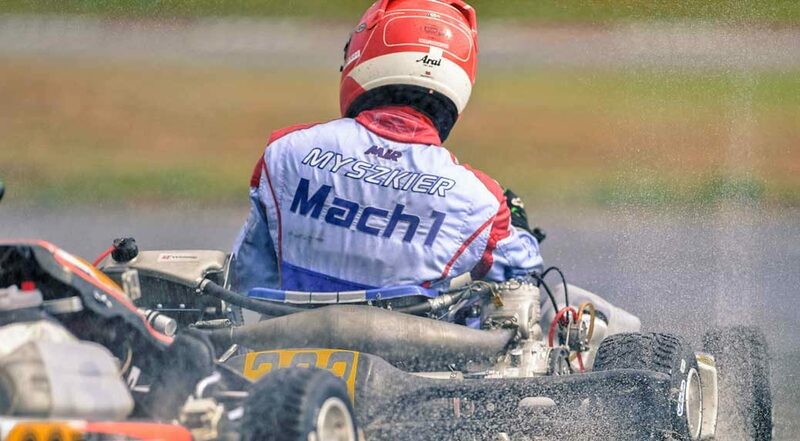 After strong results at the FIA Kart European championship, Mach1-Kart wants to continue to impress at the Highlight of the kart world championship. For that purpose they welcome the Italian driver Marco Zanchetta to the team. 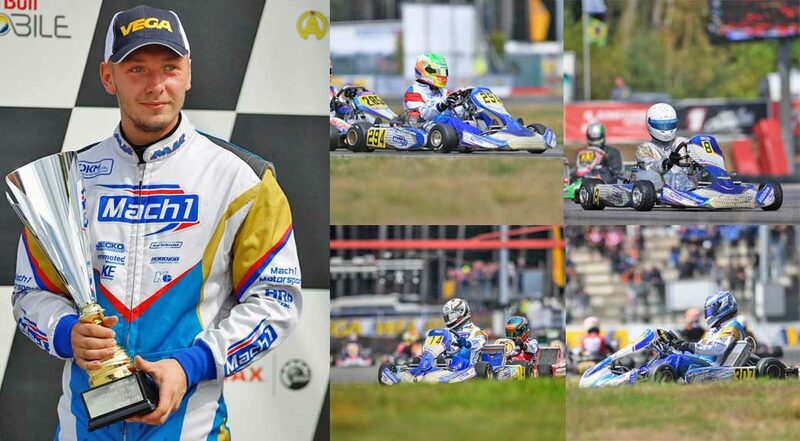 The experienced kart driver won the WSK Masters Series in 2011 and ever since belongs to the international Top-drivers in the shifterkart sport. Zanchetta is well known in Karting. The driver from Italy gets in on the top ranks of the international Kart sport for many consecutive years. Besides his title in the WSK Masters Series, he was the Italian runner-up in 2014 and also drove this year in the race series onto the winners’ podium. He knows the racetrack in Genk very well from these past years. During the final of the German shifterkart championship he has the chance to test out the race conditions of the Mach1-Chassis for the very first time. Two weeks later he will take off for the world championship also in Genk. The international KZ2 Super Cup is once again staffed top class and a great challenge for both driver and manufacturer. Last weekend, the fourth of five events of the ADAC Kart Masters took place in Kerpen. Mach1 Motorsport celebrated huge successes in extreme heat. 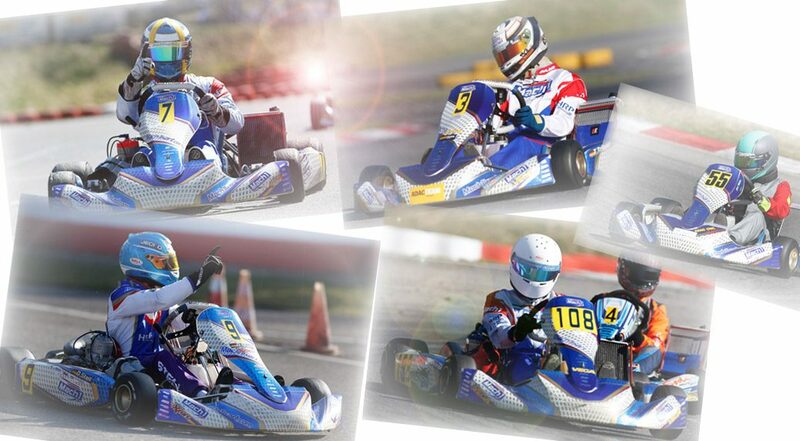 At the same time, victories also went to the factory supported team DS Kartsport. The team is currently leading the championship of the shifterkarts with Julian Müller. 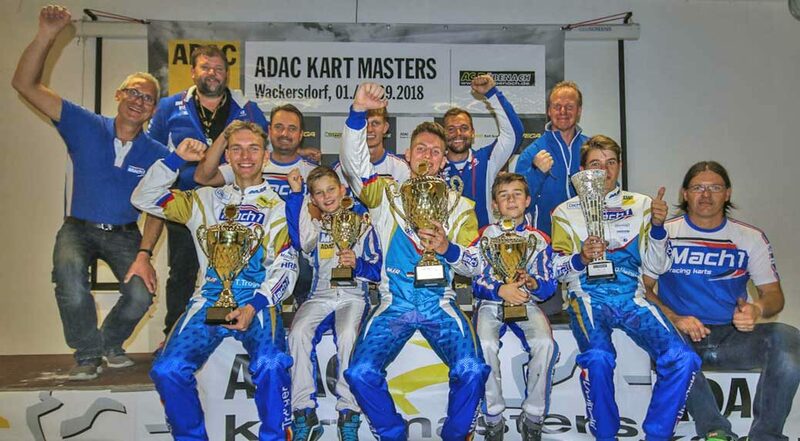 Three weeks after the half-time race of the national racing series of the ADAC in Oschersleben, the drivers of the ADAC Kart Masters started again. This time, things took place on the 1.107m long Erftlandring in Kerpen. In midsummery temperatures, 180 participants started there. Mach1 Motorsport started with four drivers. The OK-class was hard-fought this time. 34 drivers made for a filled-up field of participants and exciting races. Tim Tröger belonged to the favorites from the beginning. The Saxon won the last race in Oschersleben and drove among the front field in Kerpen as well. After qualifying and the following heats he was on third place and was on his way to victory at the first final race. A later spoiler penalty made him fall back to fourth place though. He then held this position during the second final race and thereby collected important points. He still has chances of winning the championship after these successes. Next to Tröger, David Liwinski from Poland used the race as preparation for the upcoming German Kart Championship, which is going to take place in the same location next weekend. He already did well during qualifying by coming in tenth and achieved this position at the first final race as well. Unfortunately, his good performance at the second final race was stopped due to a falling out. At the X30 seniors, Erik Müller continued his learning process. In his first ADAC Kart Masters season, he already showed his ambitions in Oschersleben. This time, he came in close to midfield in both races – on 20th and 22nd places. Shifterkart driver Julian Müller presented a great show. On his home track, the Cologne resident was able to fully attack and achieved two victories on Saturday. Things got exciting again during the final races then – temporarily three drivers exchanged blows and made things thrilling. In the end, Julian achieved a victory and a second place and thereby took the overall lead of the championship. The team is going to travel to Kerpen again in a couple of days – this time for the German Kart Championship. Filled-up fields of participants and high temperatures can be expected there as well. 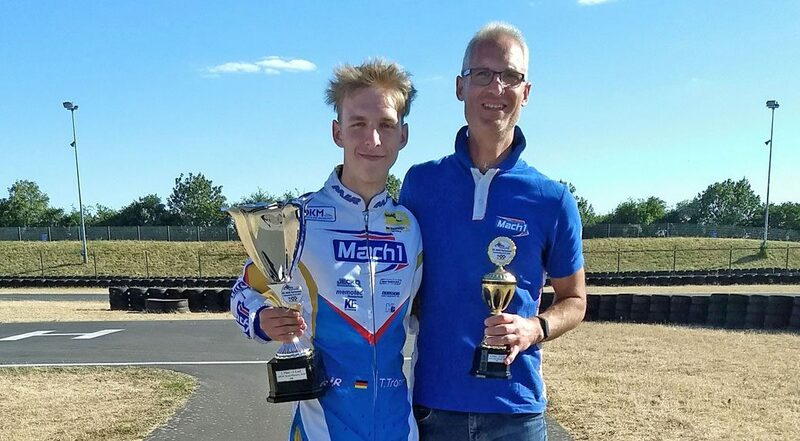 Huge joy for the German chassis manufacturer Mach1 Kart: At the half-time race of the ADAC Kart Masters in Oschersleben, OK-driver Tim Tröger achieved his first victory for Mach1 Motorsport and is on the strong second place of the championship. His team mate Erik Müller did well at the X30 seniors too. The hard work of the past weeks is now paying off. Almost 150 participants started at the ADAC Kart Masters in Oschersleben last weekend and Mach1 Kart belonged to the favorites at the OK-class right away. Tim Tröger felt comfortable in beaming sunshine and made a first impression at qualifying by coming in third. He then achieved a victory at the following heats and was on second place of the interim rankings. Tröger’s team mate Erik Müller was successful at the X30 seniors as well. During his first ADAC Kart Masters season he is getting faster and faster race by race and was on the great eighth place after the heats. He used this good starting position during the final races. The driver from East Westphalia fought thrilling duels with his competition among the front midfield and drove forward to seventh place – thereby he just barely missed placing among the cup ranks. The second race went turbulently: He unfortunately lost some ground this time and came in 15th. Mach1 Motorsport is going to continue in three weeks with the next event of the ADAC Kart Masters – on the Erftlandring in Kerpen this time. Mach1 Motorsport in Ampfing on the right track! 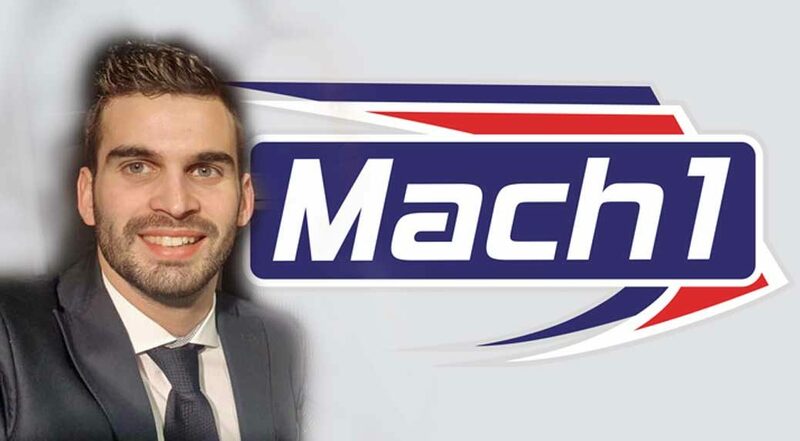 Mach1 Motorsport in Ampfing on the right track – Daniel Stell achieves cup for German manufacturer again! Last weekend, the half-time race of the German Kart Championship was in the focus of German chassis manufacturer Mach1. The team traveled to Bavarian Ampfing with six drivers and drove among the front fields of the ranked races five and six. Daniel Stell especially played to the gallery and ended up in the cup ranks of the DSKM. The renowned racing series welcomed 165 drivers from all over the world on the 1.063m long Schweppermanring south-east of Munich for the season half-time of the German Kart Champion-ship. Midsummer temperatures turned the event into a small challenge for the drivers, teams and spectators. Mach1 Motorsport passed it with flying colors though. David Liwinski started for Mach1 at the seniors of the DKM. Two weeks before the European Championship on the same track, the youngster had his hands especially full – several drivers used the opportunity as a last rehearsal. The Dutchman wasn’t unsettled by this though and started into the first final race from 12th place after qualifying and successful heats. There, David just barely missed achieving a cup by coming in sixth. At the second race, he was only ranked 15th due to a spoiler penalty. Tim Tröger unfortunately stayed behind his usual performance a little. Nonetheless, he fought his way forward from 26th place at qualifying to 17th place at the first ranked race. Unfortunately, the Plauen resident then had a falling out during the second race. At the DSKC, Pawel Myszkier was really fast. After 11th place at qualifying, the Pole had a lot of bad luck though. After third place at the first heat, a falling out followed which resulted in 18th place on the interim rankings. He then achieved the same position at the first final race. His catching-up race during the second run ended with an involuntary falling out though. Marcel Schultheiß and Tim Schröder presented themselves well after initial strains. Tim fought with technical problems during qualifying and thereby found himself at the end of the field. The driver from Lower Saxony subsequently showed a determined upwards trend and ended up on 21st place. Marcel had a double falling out during the heats, but showed his true fighting spirit then and finally even ended up on 16th position. Daniel Stell started at the German Shifterkart Championship as the big hope. The Mach1 driver promptly presented himself on a level playing field with his international competition by coming in fourth at qualifying. He confidently defended his position during the heats as well, drove the best lap time and finally started into the first final race from the second starting row. Daniel was temporarily thrown back to midfield due to quarrels though, but drove forward to ninth place again and therefore ended up among the top ten. At the second final race, the Mach1 protege highlight-ed his potential once more and ended up among the cup ranks on fifth place. The team is going to continue in three weeks at the ADAC Kart Masters in Oschersleben. The national racing series of the second biggest automobile club in the world is also going to herald its season half-time then. 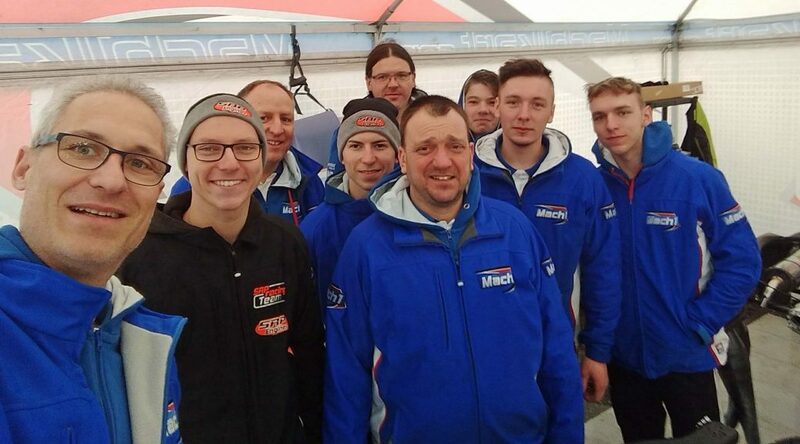 After a very successful kick-off to the German Kart Championship in Italian Lonato, Mach1 Motorsport travelled to the next event of the high class championship on German ground last weekend. In Bavarian Wackersdorf, the racing team of the traditional manufacturer started with six drivers against the international competition. About four weeks after the kick-off to the German Kart Championship, the engines blared again in Wackersdorf (Upper Palatine) last weekend. More than 160 drivers from more than 25 nations gathered on one of the most modern kart tracks of Europe and showed thrilling races. After Daniel Stell’s kick-off victory in Italy, the team surrounding Martin Hetschel travelled on highly motivated and lived up to their expectations despite a little bit of bad racing luck. At the seniors of the DKM, Tim Tröger gave it his all. Having fallen out prematurely due to an accident in Lonato, he didn’t waste any time in Wackersdorf. From the solid 24th place after qualifying, the Saxon floored it and improved his position continuously. 19th position on the interim rankings was followed by eleventh place at the first ranked race. At the second race, Tim was temporarily even on the great third place, but due to some quarrels came in 11th and just barely missed placing among the top ten. David Liwinski unfortunately experienced a bad weekend in Wackersdorf. After a cautious qualifying a heat falling out followed, which finally cost the Dutchman the hoped for final qualification. In the beginning it seemed to become a rollercoaster ride for Pawel Myszkier at the DMSB Shifterkart Cup. 13th place at qualifying was followed by an impressive third place at the first heat, which was then followed by a heavy setback due to a falling out during the second. Nonetheless, the Pole celebrated a strong comeback during the ranked races from midfield, prevailed against his opponents and finally came in on the great third place. Marcel Schultheiß also held his ground among the strong field of participants. During the first race, the routine driver was in front of his team mate on ninth place. A time penalty during the second race threw the Mach1 driver back to 14th place though and erased all hopes of placing among the top ten again. Tim Schröder fought with some bad luck during the heats, but found his rhythm again during the races and ended up on 24th place at the second final race despite an engine defect. Daniel Stell had his hands full at the shifterkarts of the DSKM again. The experienced driver proved his competitiveness during qualifying as well as the heats on the dry track, consequently drove at the front und finally started into the first final race from 9th place. There, Daniel ended up on 14th place due to a spoiler penalty, before new challenges awaited the routine driver during the second race. Similar to Lonato, heavy rain forced drivers and teams to choose their tires. In the end Stell chose slicks and was right with this again. At the end of the race he was the fastest driver of the field and fought for a place on the podium. A small collision and later time penalty threw him back to 16th place though. “Of course we had hoped for a little more regarding the cup results this weekend. Unfortunate situations on the track sadly threw our drivers back a bit – a lot more would have been possible with our speed. The rematch is going to follow at the half-time race in Ampfing – Pawel has shown where we want to go”, Martin Hetschel said ambitiously in the evening. In three weeks the drivers are going to start at the half-time race of the DKM on the Schweppermannring in Ampfing. A nearly perfect racing weekend now lies behind the team of Mach1 Motorsport. The racing department of the German chassis manufacturer travelled to the kick-off event of the ADAC Kart Masters on the Schweppermannring in Ampfing. In the end, Mach1-Kart drove back home with two racing victories and the overall championship lead in the KZ2 class. Last weekend, the eleventh season of the ADAC Kart Masters started in Bavarian Ampfing. For the beginning of the season, the national racing series took place on the southernmost track of this year’s calendar. 144 drivers started overall. Mach1 Motorsport concentrated on the OK, KZ2 and X30 senior categories. Erik Müller broke new ground at the ADAC Kart Masters: He came from clubsport and now entered the national racing series. The youngster ended up behind his own expectations during qualifying by ending up on 26th place. Erik also got stuck in the far midfield during the heats. The Mach1 driver then hit the ground running during the first race. Due to great maneuvers, the young kart driver overtook his opponents and finally came in 17th. Erik unfortunately had to deal with a technical falling out at the second race then. Team-newbie Tim Tröger started in the OK class with high hopes. After a falling out during the heats the mood was a little gloomy though. The Saxon didn’t get distracted by this though: From 19th place, the youngster raced through the field and drove his way forward to seventh place until crossing the finish line. That wasn’t enough yet: During the second ranked race, Tim improved his performance even more and finished the last race right behind the winner on second place. David Liwinski drove among the front field of the OK class as well and caused joy in the team tent. From seventh place, the Dutchman crossed the finish lines of the races on fifth and fourth places respectively and thereby ended up among the highly competitive cup ranks twice. Things went considerably heated for Mach1 Motorsport at the shifterkarts. Daniel Stell celebrated a phenomenal start into the weekend. After the fastest lap time during qualifying, the Hammelburg resident drove at the front of the field during the heats as well. During the first race he had to deal with a falling out due to a technical defect though. This did not lessen his fighting spirit though. With best times, the routine driver raced forward from the back of the field to sixth place at the second race and the lead during the third race and thereby perfected his performance. Julian Müller also showed a top performance. The Cologne resident was always among the top positions of the class. On third place after the heats, the KZ2 driver ended up on the good fifth place at the first race. During the second race Julian took his chance and gained the lead. The ambitious driver raced across the finish line as the winner and even achieved to take the championship lead by coming in second at the third ranked race. Things are getting serious again for Mach1 Motorsport in only a couple of days. From April 13th – 15th, the German Kart Championship is going to start into its new season in Italian Lonato. The fast Germans want to drive among the forefront on the South Garda Karting Circuit as well. German kart manufacturer came to a positive conclusion. All three drivers drove on the front positions among the international field of participants. There was no time for boredom during the winter months for Mach1 Kart. The manufacturer from Swabia further developed the current FIA5-chassis for the upcoming homologation phase and bound a new factory driver for the OK-category: Tim Tröger. Now they started at the first event of the year: The venerable Tropheo Andrea Margutti in Lonato. More than 250 drivers from all over the world met on the 1.250m long track on the brink of Lake Garda. Mach1 Motorsport started with three drivers in the classes OK and KZ2. The weather caused additional excitement. During the heats and races it rained heavily and pushed men and machines to their limits. Newbie Tim Tröger successfully started in the OK-class and already drove among the top ten during the heats. He was able to continue like this during the pre-finale as well and came in seventh despite a time penalty. The Saxon was on his way to the podium during the big final race then, but had to end the race prematurely while being on third place due to a racing accident that wasn’t his fault. His team mate David Liwinski also drove really well, but had some bad luck during a heat and therefore fell from 10th qualifying place back to 18th place on the interim rankings. He fought his way forward again during the pre-finale and came in twelfth. Due to problems with his carburetor he had to end the final race prematurely too though. Daniel Stell was among the fastest drivers at the shifter karts the entire time. He made himself known to his competition by coming in eighth at qualifying and was able to tie in with this during the heats as well. His starting position for the final race was ideal due to second, third and fourth places. He started into the first race from the third starting row. A collision and a time penalty during the pre-finale threw him back considerably for the final race though. He then showed his qualities despite the adverse weather conditions and came in among the top fifteen. The team is going to drive on German soil from April 6th – 8th. Then, the first race of the ADAC Kart Masters is going to take place in Ampfing.